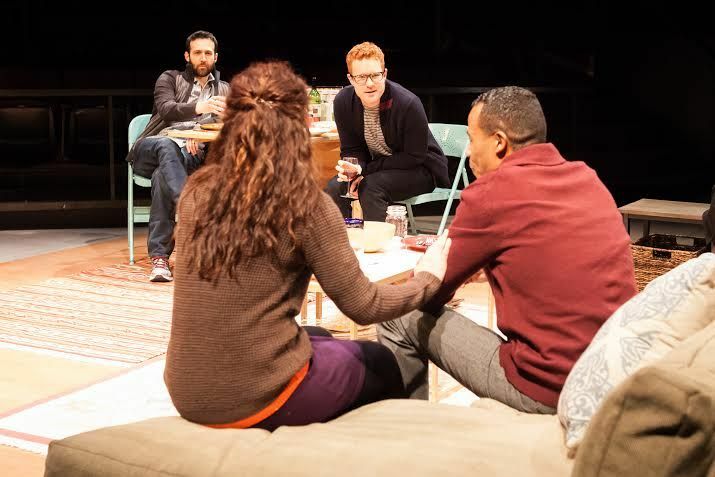 I caught an early double bill in this year’s 38th annual Humana Festival of New American Plays at Actors Theatre of Louisville. What I saw -- “The Christians” and “The Grown-Up” – aren’t recommendable, but what the festival’s choices seem to be saying about the state of the art is absolutely worth a conversation. This festival appears to be taking a brave leap into the can-only-be-guessed-at future. Both plays ran without an intermission. I did a quick check of the Humana program and all five full-length plays and one compilation (written as a showcase for the acting interns) are long one acts – so this year looks like it acknowledges there’s no fighting the shortening attention span of the American audience. Or maybe that of young playwrights. “The Christians” by Lucas Hnath is set in a Florida mega-church. It was commissioned by Actors Theatre, which makes sense – religion has increasing presence nationally (on stages including the political), and is very much a part of community life. The production is set on the church’s ‘stage,’ with giant screens (showing images of doves in flight, blooming flowers, glorious sunrises and sunsets, the Grand Canyon and the American Eagle) on either side of the Cross; a choir with the organist (hidden behind a planter); and a collection of impressive, throne-like chairs facing the congregation. The first thing young writers are told is to ‘write what you know.’ But that isn’t meant literally. It means draw from what you know and what you feel powerfully and make it larger. The greater the reach, the more potential for the play. “The Christians,” for me, suggested our inward-looking era of social media where everyone reports via Facebook, text and Twitter every thought and action. Why tell a larger story when you can tell your own? The conflict is that one day Pastor Paul announces “We no longer believe in Hell.” A quick series of one-on-one debates with his African-American assistant, a church elder, a choir member and his wife chronicle the quick descent of his formerly meteoric rise. It takes a first-rate writer to dig deep in a short amount of time, which is padded here by a long choir performance which would have better served the play by beginning while the audience was entering the theater, to bring us immediately into the play’s world. “The Christians” thinks small, and there are no surprises in any of the conversations. Everyone reacts exactly as expected, leaving the pastor basically on his own. Hnath’s program interview said his one-on-one arguments/counter-arguments were inspired by the Greeks. Not inspired enough to realize the great philosophical questions of humankind were what powered them. Pastor Paul has moments of introspection but his internal conversation isn’t tortured by self-doubt. He reassures himself that he’s right because God has spoken to him. And while the pastor has anxieties about aspects of his life, he never worries about greater, obvious questions. “The Christians” would be more satisfying if Hnath had made his obtuse pastor face the biggest questions head-on: Why does God speak the truth only to him? If he knows the truth of what God has told him, why isn’t he taking it to the world beyond his mega-church? Or is it Hnath’s point that the pastor is remarkably obtuse? That could have been interesting if he’d taken the challenge of giving him dimensions. Harrison likes big ideas and he has another one for “The Grown-Up”: 10- year old Kai comes upon a crystal ball, here played by a magical crystal doorknob which shoots him forward into moments in his adult life with every new door – his 20s, 30s, 50s, 80s. The doorknob is present in every vignette to take him on to the next door, except he has trouble remembering how he got where he happens to be at the moment. There’s no time for any of Kai’s adventures to take hold, much less his humanity, because “The Grown-Up” is about high concept, not character. Kai is never more than a sketch in service to the Big Idea. The plot quickly fractures, as Harrison, too, draws from life to satirize his stint taking meetings in Hollywood (a lot of which feels like padding). Then we’re following the producer’s assistant, and Kai’s sister and getting some commentary from the old sailor who brought the doorknob to land from a tall ship generations before. Actors take turns acting as a narrator, so “The Grown-Up” at times plays like a book-on-tape. It’s an experiment, it makes sense in the end, but before the end the device is jarring enough to pull some of us out of the action. Harrison brings together old magic and modern society, but surely there’s still room for disciplined storytelling. “Partners” by Dorothy Fortenberry. Clare has big plans with her best friend Ezra — starting a food truck, making him marry his boyfriend — until an unexpected windfall forces them to face how they truly feel about money and commitment. Two young couples struggle with personal finance, the meaning of marriage, and the deeply human capacity for self-sabotage—as they decipher the ongoing mystery of how to be an adult. “brownsville song (b-side for tray)” by Kimber Lee is about an 18-year old killed in his Brooklyn neighborhood by a senseless act of violence. Time moves in scattered rhythms, pivoting unpredictably between before and after, as Tray’s loved ones stumble through loss, find each other, and fight their way toward hope. “Steel Hammer” with music and lyrics by Julia Wolfe, directed by Anne Bogart and created and performed by her SITI Company. The legend of steel-driver John Henry is told with original text incorporated from playwrights Kia Corthron, Will Power, Carl Hancock Rux and Regina Taylor. “Remix 38” ATL’s 2013-2014 Acting Apprentice Company by a collection of young writers who wrote pieces inspired by plays from Humana Festival’s 38 seasons, from “Crimes of the Heart” (Beth Henley’s Pulitzer Prize winner from 1979) to “The Method Gun” by Rude Mechs in 2010.